From The Era 5 November, 1929. ​The central figure in Machines, the new play by Reginald Berkeley to be produced tomorrow (Thursday) at the Arts Theatre Club, is James Mansell, a Labour leader, who, in his efforts to obtain equality of representation in the control of industry for the workers, finds that he has to fight the machines of modern life - the Press machine, the political machine, the law machine, the public opinion machine - besides the machines of industry. Edmund Willard will be Mansell, the Labour leader; George Zucco, Col. Willoughby, a Conservative M.P. ; and Marie Ney, his daughter, Joyce, who plays a dominant part in Mansell’s career from shop steward to Member of Parliament. Brember Wills will be MacAlister, owner of the factory where Mansell works, and also the Judge in the Court of Justice scene. Frank Cochrane will be Lord Bouverie, a "Press Lord", with J. Leslie Frith Summerscales, editor of his paper, The Daily Tribune (also Counsel for the Prosecution in the trial scene), and Roland Culver Henson, his managing editor (and Supt. Vyner, Scotland Yard). Cherry Hardy will be Mansell’s wife : George Oarr, Harry Paine, one of his fellow-workers the factory; and Charles Mortimer, counsel for the defence, Cecil Calvert, Graham Stuart and Ursula Bennett are others in the long cast. 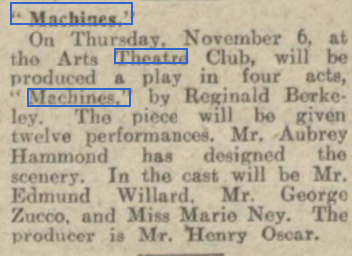 From The Era - Wednesday 29 October 1930. 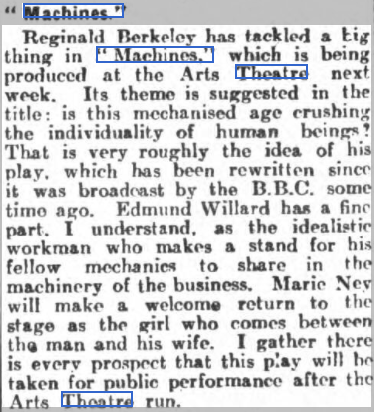 From The Stage - Thursday 23 October 1930. 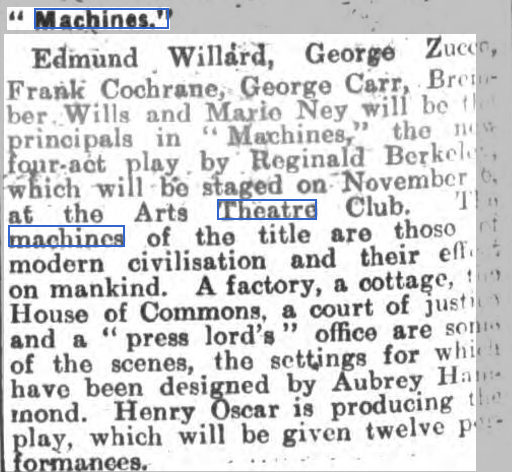 George Zucco was a Canadian, who found himself in London after the Great War. 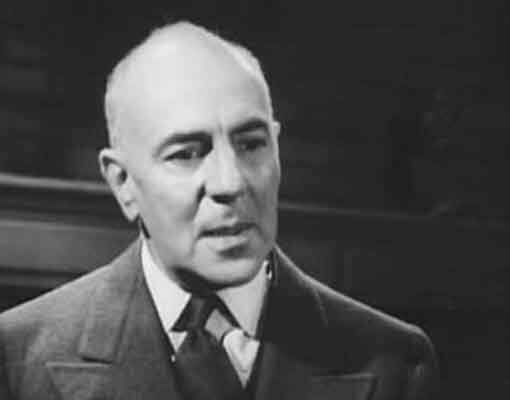 Following performances here, he moved to America, and became an established actor in such films as The Adventures of Sherlock Holmes (1939) and The Cat and the Canary (1939). I have always thought he showed a resemblance to my grandfather.